Warm birthday wishes! 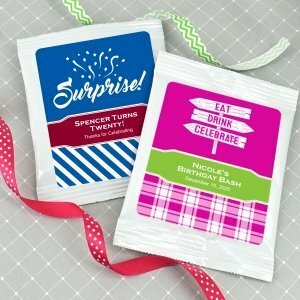 Our Birthday Cocoa Mix Favors are a cozy and creative way to make an exciting milestone birthday shout-out or express your gratitude to party guests! 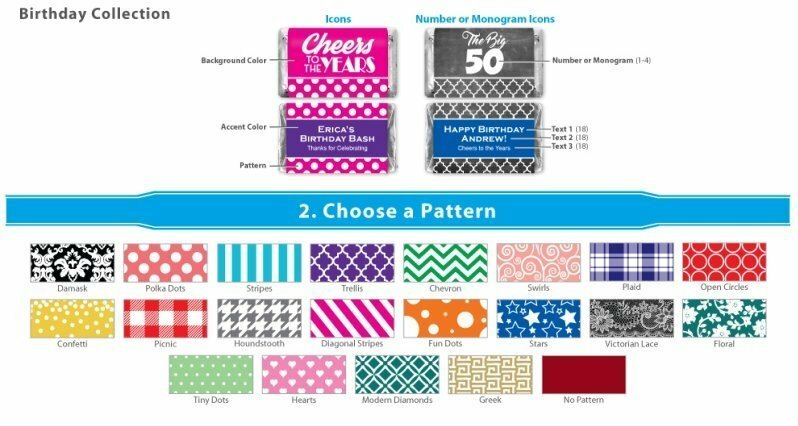 To personalize them, you can choose a pattern, a design icon, 2 colors, and 3 lines of text. Each packet is a single serving of drink mix and comes sealed in a beautiful white gloss pouch (4"w x 5.5"h). Instructions are on the back on how to mix the pouch contents to create an irresistible indulgence. Easy assembly with self-adhesive labels. Cocoa Packet Info: Each glossy white packet measures about 4" wide x 5.5" tall and holds a single serving (1 oz) of gourmet hot cocoa mix (hot chocolate). Packet contents have a shelf life of 1 year and are not kosher. For the personalized cocoa packets, can I provide my own artwork? I'm sorry, we’re limited as to what we can print on the Personalized Birthday Cocoa Packs so we aren’t able to do custom designs.